Warning, all of the following ads are offensive in one way or another, please proceed with caution… once you’ve seen them all vote for the ad you think is the most offensive. When you hear about someone getting attacked by a shark, your normal reactions might be shock, sympathy, or concern. Not if you’re PETA—they see it as appropriate time boot up the Photoshop and create an image of a bloody leg coming out of a shark’s mouth. This billboard was part of their “payback” series where they lambasted anyone who was attacked by an animal. Sticking with the kid theme… this billboard takes the incredibly complicated issue of autism and uses some very suspect links between dairy and autistic behavior (one “study” was a subjective review of 20 kids with autism and their behavior after cutting dairy from their diet). It also callously implies that getting rid of dairy might cure autism, giving false hope to parents of autistic children. Now if you call us out on this one and say that this really isn’t an ad per se, but really more of a stunt, you’d be right. But we couldn’t resist putting this one in. Nothing makes the case to give up bacon like putting a half-naked pregnant woman on display in a public place. Even that kid with the pacifier thinks this stunt is stupid. “Mommy, why is there a naked lady in a cage?” Good luck parents! All right—we know already! This one is also a stunt. We’re not even sure what these idiots are trying to say with this one. But apparently sponsoring a dog show of purebreds makes the American Kennel Club exactly like racist and violent a-holes who want to eliminate minorities using tactics like violence and intimidation. Personally we don’t like our vegetables to touch our potatoes on our dinner plate—I must be exactly like David Duke! We’re not even going to touch this one. Seriously, not touching it. 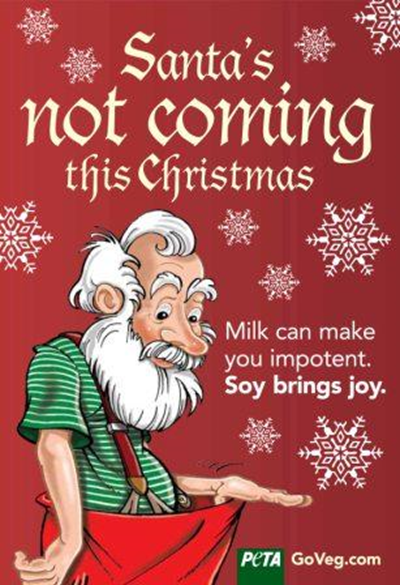 PETA has a special talent for twisting religion into justification for their positions—they also have a special talent for offending religious people through ads like these. 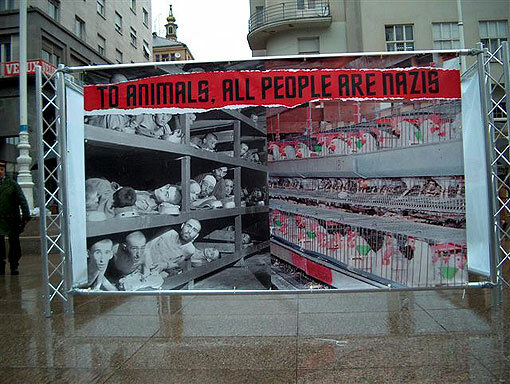 PETA’s “Holocaust on Your Plate” campaign equated abuse of Jews by the Nazis with farmers who raise animals. Run by Matthew Prescott, who now works at the Humane Society of the United States, this campaign was rightly criticized by many human rights organizations and actually legally banned in Germany. 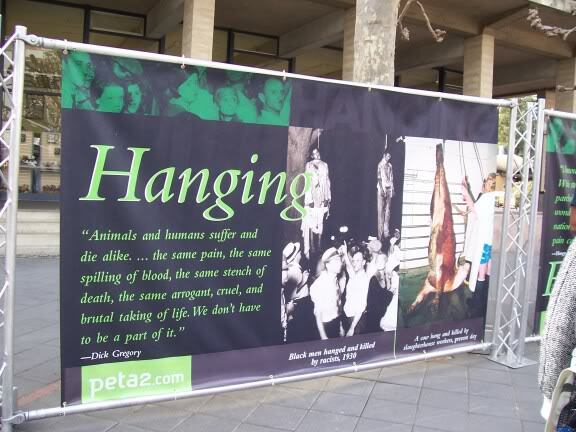 Because they got such rave reviews after equating Jewish people with chickens, PETA doubled down and created a campaign called the “Animal Liberation Project.” This gem compared the civil rights struggle of African Americans with lab animals and livestock. Racist much? Seen enough? Time to vote!